Thank you all for showing your support. Loved seeing everyone! 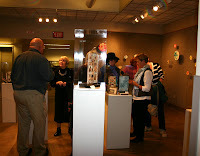 Deborah Greenwood's beautiful mixed media pieces in foreground. My wonderful friend Bill Schlambush figuring out the Dolly Parton quote. A little brain teaser. Bill, of course, with that big brain of his, figured it out with only minimal hints.